This is a guest blog post from Sean Kosofsky, the presenter of our free webinar, “6 Biggest Mistakes Executive Directors Make and How to Avoid Them.” Click the link to join our recorded session. From both a human resources perspective and a board perspective, you should assume that more than half of your time will be spent in the care and feeding of relationships around your organization. People are emotional, complicated, and have a lot of feelings. Many may be unprofessional and bring their personal stuff to work in unhelpful ways. Some important aspects of management and being a “good” Executive Director means having patience, empathy, and emotional intelligence. Deciding when to disconnect from these challenges and when to engage them is an ongoing struggle. Board members will also need a lot of attention since they “own” the nonprofit. They can be your best allies in the community, in terms of raising money, and in your own job security. Invest time in building rapport, trust, and alignment. For example, arrive at board meetings early and make a point of talking about each other’s families or vacations. Also, consider being helpful to board members in areas of their life outside of the organization. Finally, consider dedicated meals or happy hour meetings for the sole purpose of getting to know each other and not talking primarily about the organization. Let’s not forget about donors. Depending on your organization, this may be most of your people-centered focus. In short, assume that a lot of your time will be spent keeping people happy, productive, and inspired. 2. Get an employment contract. I don’t know why someone didn’t tell me this sooner, and why I didn’t insist on it sooner. When you are a new executive director, you don’t want to piss anyone off by asking for a contract because you’re so excited about the job. You might fear that it’s confrontational or ungrateful… but forget all that. You have to look out for you, your income, your family, and your best interests. That means making sure you aren’t fired without cause. Get an employment contract. It is worth 2 hours with an employment lawyer to protect your career. 3. You will mess up. Too often, we are afraid of being vulnerable or imperfect in front of our staff, board, or stakeholders. Get over it. You will mess up. Every ED does. Sometimes it’s in private and sometimes it is in a spectacularly public way. Move on. People with much bigger jobs than you make far bigger mistakes daily and they keep on going: so should you. Don’t take the job too seriously. Have a life. Invest in relationships, protect yourself, and forgive yourself in advance for mistakes. But, always push for excellence. Others will see this and it will pay dividends. 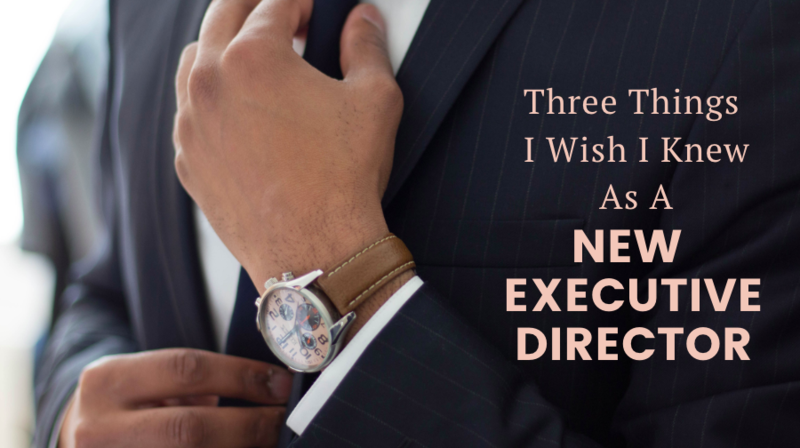 If you’d like to learn more about how the top executive directors perform, please watch my free webinar on “6 Biggest Mistakes Executive Directors Make and How to Avoid Them”, hosted by Wild Apricot. Sean Kosofsky, MPA, has worked in and led nonprofits for 25 years. His background is in policy, direct service, program development, communications, fundraising and management. He has served as Executive Director for 4 organizations and helped hire several others. He calls himself the “Non-Profit Fixer” because he takes a holistic approach to “tuning up” organizations for better performance. He offers a course called “Executive Director Boot Camp: From Cautious to Confident in Less Than 10 Hours".